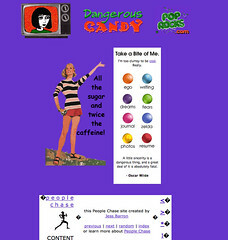 Inspired by Ernie (who was himself inspired by this guy Jason Santamaria's blog post), I went to the Internet Archive and pulled up some early poprocks.com screenshots. I registered the domain in 1997, and launched the site that summer. I posted a dream journal and online diary, hand coded in HTML, before the existence of blogger.com. At the bottom of the page you will notice the "People Chase" webring code. Webrings are soooo 1997. I bet the LOLcats of today wouldn't even know what they are. UPDATE: Here's what the site looked like in June 2000, complete with clickable links.